Pickers struggling to access a product waste time and your money. Pickers that gain quick and easy access to a pick location get the job done efficiently. They make better use of the time available to them, thereby significantly helping to reduce costs. The UniCarriers EPL truck is designed to provide quick, ergonomic and cost-effective order picking. The EPL is a medium level order picking truck available in two basic configurations to facilitate order picking either from racking or shelving systems. The EPL 100 allows easy order picking from a height of 2800 mm to 3400 mm. By providing the operator with immediate free access to pick locations, the EPL reduces the time required for order picking, thereby cutting costs and increasing profitability. Are you interested in UniCarriers EPL? Want to know more? UniCarriers is very pleased to announce that it has been nominated for two awards in the prestigious International Forklift Truck of the Year (IFOY) competition. Our innovative Driver Presence Sensor (DPS), installed in all of our EP trucks, is one of the contenders in the Special of the Year category. 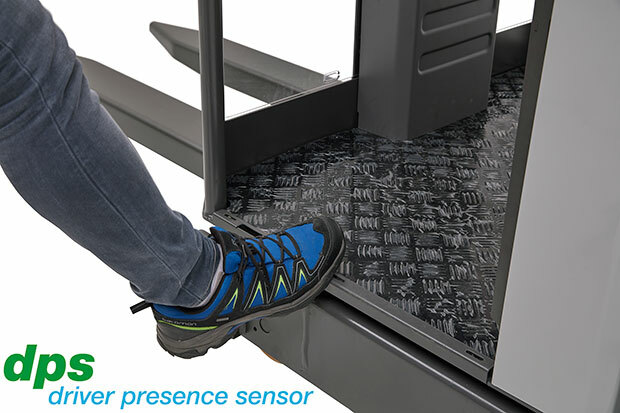 Replacing the traditional 'dead man' switch, the sensor covers a wide area on the cabin floor, allowing the operator to move freely during operation and reducing strain. The nominated trucks and features will be examined rigourously during test days in March 2017, and the best in each category will be decided by a jury of 25 respected trade journalists, from 16 countries. The winners will be revealed at Munich's Transport Logistic trade fair in May - we're hoping to see you there! Low step in reduces fatigue and improves performance. The IFOY-nominated Driver Presence Sensor (DPS) covers a wide area, establishing driver presence and allowing them to move freely around the cabin.